While the cause of bruxism is multifactorial, many professionals believe that clenching and grinding teeth can be brought on by stress and bite problems. 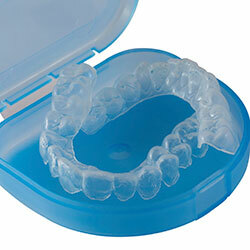 Bruxism can cause undue wear and damage to otherwise healthy teeth and jaw joints. Clenching and grinding teeth can be painful and uncomfortable, causing headaches, jaw and neck pain, muscle fatigue, and even nerve problems. We offer diverse solutions, including bite splints, nightguards, and bite therapies to reduce bruxism and relieve discomfort.